General John W. Handy is Commander, U.S. Transportation Command (USTRANSCOM), and Commander, Air Mobility Command (AMC), Scott Air Force Base, IL. USTRANSCOM is the single manager for global air, land and sea transportation for the Department of Defense. Handy was commissioned in 1967 and received his pilot wings in 1968. He has commanded the 21st Air Force at McGuire Air Force Base, NJ; the Air Mobility Commandâ€™s Tanker Airlift Control Center; two airlift wings; and a maintenance squadron. He served as the Director of Operations and Logistics for USTRANSCOM; the Air Forceâ€™s Director of Programs and Evaluations; and Deputy Chief of Staff, Installations and Logistics, Headquarters U.S. Air Force, the Pentagon, Washington, DC. Handy is a command pilot with more than 5,000 flying hours, principally in airlift aircraft. As a C-130 pilot, he logged more than 300 combat hours in Southeast Asia. 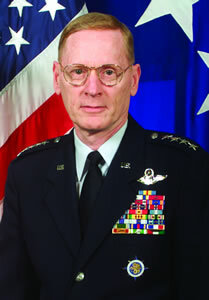 Prior to assuming his current position, the general was Vice Chief of Staff, Headquarters U.S. Air Force, Washington, DC. Q: Good afternoon General Handy. Could you start with an overview of the Air Mobility Command? Have there been any major changes in the past two years? A: The global war on terrorism (GWOT), initiated by the terrorist attacks on September 11, 2001, began the longest sustained operation of air mobility forces since Operation Vittles, the 1948-49 Berlin Airlift. With operations in Afghanistan, Iraq, the Philippines and the Horn of Africa, GWOT is truly global. The demands on air mobility are great, and Americaâ€™s tanker and airlift forces rose to the occasion, achieving what no other air force in the world is capable of doingâ€”projecting and sustaining major military forces into remote and austere regions under the most challenging of conditions. This intense air mobility effort is only possible through the superb partnership of active duty personnel, Air Force Reserve Command, Air National Guard and the civilian aviation industry. While this was taking place, we changed how Air Mobility Command goes to war. Today, the world is a much smaller and more dangerous place. As an organization, we must streamline operations and leverage technology to respond. On October 1, 2003, AMC adapted to the changing environment with the first major revision in AMCâ€™s organizational structure in more than a decade to make us lighter, leaner and more agileâ€”in a word, expeditionary. Highlighting the importance of forward operations, 15th and 21st Air Forces were redesignated as Expeditionary Mobility Task Forces, or EMTFs, with responsibility for AMCâ€™s four subordinate Air Mobility Operations Groups. AMCâ€™s staff directorates transformed to an â€œA-staff,â€� adopting a common, joint organizational structure as they continue to focus on â€œorganize, train and equip.â€� And, at the heart of it all, 18th Air Force was reactivated as AMCâ€™s warfighting headquarters with the Tanker Airlift Control Center as its Air Operations Center, slimming AMC to a single warfighting Numbered Air Force (NAF). Headquartered at Scott AFB, IL, 18th Air Force leads the commandâ€™s global airlift, air refueling and aeromedical evacuation operations. Within AMC, all twelve wings, three independent groups and two EMTFs report to the 18th Air Force. The activation of 18th Air Force takes us to the future of NAF warfighting roles. It gives us a clean reporting chain, reconnects the disconnects and puts the NAF in operational control. It places responsibility for warfighting directly with the 18th Air Force commander. The 15th and 21st EMTFs serve as the lead agencies responsible for the full range of en route support and worldwide mobility execution from airbase opening to sustainment operations. They are the key to the execution phase of warfighting. Q: What role has the Civil Reserve Air Fleet (CRAF) played in the recent operations? Whatâ€™s your reflection of CRAF and its future alongside the Air Force? A: Even before we activated CRAF, our commercial carriers volunteered their tremendous capability to airlift troops and cargo for DoD. We are thankful to these airlines that have played a major role in supporting U.S. military forces in Operation Iraqi Freedom. We simply could not have met the massive, fast-paced demands of our troop deployment without the dedication and determination of the men and women of CRAF. From February 8, 2003, to June 17, 2003, 11 CRAF commercial carriers flying 47 passenger aircraft completed over 1,625 missions and airlifted over 254,000 troops to destinations around the world. The majority of these missions were to the Middle East. During this same period, voluntary participation by 14 commercial carriers moved over 11,000 short tons of cargo in support of Operation Iraqi Freedom. As U.S. troops deploy to and return from Southwest Asia in the coming months, commercial augmentation will provide the majority of passenger service and an increasing percentage of the cargo service as our organic airlift is designated for delivery into high-risk locations. Q: The condition of your tanker fleet has been a hot topic in the news this year. What are the biggest challenges facing the current fleet? What steps are you taking to prepare your fleet for the future and to work towards replacements? A: A reliable air refueling capability is essential to the defense of our nation. While the KC-10 is still a very viable aircraft, our KC-135 fleet averages over 43 years old, and the oldest KC-135E models have a variety of problems, especially with corrosion in critical areas. The slightly newer KC-135R model is a highly modified airplane with newer, more efficient engines and significantly improved internal systems so it is a far more capable aircraft. Our biggest challenge with our tankers is corrosion and the overall effects of aging. The corrosion problem is partially remedied by large scale reskinning of the airframes, but the costs for the depot to physically rebuild KC-135s one at a time are steadily increasing. That is a challenge. The biggest challenges are KC-135 E-model strut replacements, fuels maintenance and depot maintenance costs. Currently, we have 81 tankers in the Guard and Reserve with flight parameter restrictions until interim repairs are made to their engine struts. These aircraft must be repaired by September 30, 2004, or they will be grounded. Fuel cell maintenance, an aircraft aging issue, equated to 22 percent of all KC-135 non-mission capable hours for FY03 and is the number one driver behind scheduled maintenance inspections. Further, the cost for programmed depot maintenance continues to rise. In 1990, the inspection cost approximately $1 million to $2 million each for four years. In 2003, the cost rose to approximately $5 million to $6 million every fifth year. We cannot continue to fly KC-135s forever, and the longer we wait to recapitalize the fleet, the more risk we face of the fleet being grounded for some reason. If we start to recapitalize our tanker fleet today, the nation will still have eighty-year-old tankers when we get rid of the last 135s. That is the entire fleet that we have, including R models. That is the reality that we face. We are doing everything we can to drive home the point that the nation has a shortfall. Even with the current 135Rs and Es and KC-10s, we have a shortfall in our air refueling capability. And so even in Iraq, we were not able to service every single requirement that we have. The war fighter prioritized air-refueling tracks for bombers and fighters, both Air Force and Navy. We have a validated requirement for more tankers, and if you look at the challenge, the best option we have is the proposed KC-767 lease/purchase. That is the near-term solution to a long-term challenge. Q: How would you characterize the condition of the transport fleet as a result of the intense operational tempo since OEF? Has it affected how you handle routine and heavy maintenance? A: Our airlift fleets have performed superbly. We have increased our mission capable rates by 3 percent to 5 percent across the board over the last two years despite significant increases in aircraft utilization since September 11. We have not seen significant signs of any detrimental effects of the intense tempo on the fleet in the short-term since OEF began. But, we will not know the full effects until some years down the road as the aircraft continue through their depot cycles, and we have opportunity to inspect them in depth. The increased tempo has increased maintenance requirementsâ€”much like your car would require more maintenance if you suddenly increased the annual mileage and drove it hard on dusty, country back roadsâ€”but maintenance cycles are on schedule with no significant requirements deferred. This performance is a direct result of the dedication of our aircraft maintenance, supply and transportation professionals and our partnerships with the depots and civilian aviation industry. Q: Looking at your key issues, such as maintenance downtime, available crews, spare parts availability, logistical support, number of aircraft, etc., how near capacity have you been? At any time was it difficulty to muster the aircraft and crews to do what was asked? A: Due to the nature of air mobility, the commandâ€™s operations tempo has remained high. Air mobility forces are some of the first to react for the movement of personnel and critical supplies prior to, during and after hostilities. GWOT has placed unique demands on the force, and constant coordination is required to ensure we are ready and able to meet our commitments. Each of the key issues you mentioned have been a critical linchpin for operations at one time or another, especially in the high demand deployment and redeployment phases. How near to capacity have we been? While we have been able to accomplish our mission, it has been through the ability to reallocate our resources and focus on the userâ€™s priority requirements. This allocation process and our ability to â€œswingâ€� our forces ensures we can meet the immediate needs but also means that other requirements of lesser priority may be delayed. At times it has been a challenge to keep the right force package, but through selective mobilization of the Air Reserve Component, proactive positioning of resources, commercial augmentation and the ingenuity and effort of our airmen, we have met the needs of our customers. Capacity is a relative term. If you look at global commitments and potential requirements in addition to OEF and OIF levels of effort, many of our customers would say that we do not have enough lift, as their â€œpriorityâ€� for lift may not be satisfied exactly when they wished. We are attempting to address this through the procurement of additional airlift aircraft, lease/purchase of tankers, as well as an ongoing reinvestment effort in both our airlift and air-refueling fleets. From a logistical standpoint, we have provided as many aircraft as possible to meet the warfighterâ€™s requirement. However, this required a higher than normal logistics tempo to generate the required aircraft to support the increase of flying hours. The difficult part is meeting airlift requirements with the current number of C-17s. Air Force units possess 112 C-17s with a stated need (of at least) and congressional approval for 222. Additional buys are needed to ensure future airlift requirements are met. Spare parts supportability trends have been positive over the past few years due to increased funding and various initiatives Air Force-wide specifically targeted to improve the severe negative trends we experienced in the late 1990s. Our wholesale suppliers have done an excellent job keeping pace with current demands. Even so, we have taken a proactive approach, â€œoperational supply,â€� to further enhance aircraft supportability of aircraft operations worldwide. We already had an en route supply structure set up to support AMC missions, and we took it a few steps forward and beefed up the supply stocks at locations with increased traffic. We added mobility readiness spares kits (MRSPs) to select locations, and also deployed MRSPs to other surge locations around the globe. In addition, aging weapon systems present many changelings, so we constantly review the assets weâ€™ve positioned forward, and closely monitor and fill zero balance and shortage conditions at all locations. This process allows increased flexibility, a smaller footprint and provides global visibility of aircraft parts. Q: Were there any technologies that were exceptionally useful, either inside or outside the aircraft, in allowing AMC to perform its assigned missions? A: Night operations were our best line of defense, both in Iraq and Afghanistan. The key to those operations was night vision imaging technology. A Night Operations Team from Air Mobility Commandâ€™s directorate of operations at Scott AFB started five new night vision goggle (NVG) programs and quickly qualified basic C-17 and C-130 crews for NVG takeoffs and landings at airfields marked only by infrared lighting. That was in March 2002. We now have nearly 70 percent of our C-17 aircrews NVG airland-qualified. Air mobility forces flew more than 1,000 NVG sorties as part of OEF and OIF. They also conducted NVG combat airdrops, without any mishaps, over Afghanistan and Iraq. NVGs even helped tanker crews maintain situational awareness during night aerial refueling over hostile territory. C-17 aircrews also used night-vision goggles during the historic drop of the 173rd Airborne Brigade behind enemy lines in Northern Iraq. They found that because the operations were at night, on an unimproved airstrip with no lighting, NVGs were essential. Once considered a special qualification, NVGs are now a mainstay for the AMC aircrews. It was the use of these special goggles that allowed the aircraft to virtually sneak in and out of the area. Q: How well has the rest of the Air Force and DoD agencies prepared en route facilities and bases to serve the logistical and support needs of your transportation system? A: The existing en route structure has proven adequate for the mission and was augmented at selected locations by specially trained and deployed forces based upon the expected mobility air forces (MAF) taskings. These Expeditionary Contingency Support (ECS) teams provided and continue to provide the additional expertise required at locations when increased throughput and basing of aircraft demand. In addition, we frequently deploy Tactical Airlift Control Elements (TALCE) to those locations where command and control is either absent or requires augmentation to support the airlift operations. By utilizing the ECS, TALCE and other MAF expeditionary forces, we are able to rapidly respond to events worldwide while keeping our forward based footprint to the absolute minimum. DoD agencies involved in servicing our en routes have met our logistical needs. No mission is the same, so coordination between host nations and DoD agencies is a continuous process to meet en route requirements. Q: How heavily have you had to rely on the Reserve and National Guard components of the command to fulfill your worldwide commitments? Have the combined operations highlighted any organizational, operational or strategic issues that you feel need addressing? A: Active-duty and Reserve airmen are working side by side and facing the same wartime challenges while deployed for OIF. It is impossible to tell who is active and who isnâ€™t, except for the patches on their uniforms. Seventy percent of Air Force reservists activated is sent to work under Air Mobility Command. Q: Do you foresee a role for unmanned platforms within AMC in the next 10 years? A: Unmanned aircraft may not be assigned to AMC units, but they can play roles in future global mobility operations. As you know, Predators and Global Hawks provide our forces vital ISR information today. That will continue, but it is reasonable that we will use UAVs to assist us in the survey of airfields, landing zones and drop zones in denied areas. Other UAVs may be used to detect the use of chemical, biological or radiological weapons in areas that we intend to operate-base opening operations will be enhanced. UAVs will also play roles in providing force protection measures (surveillance and force-on-force) around our bases in hostile areas. Q: Has the downturn in the commercial airline industry helped your retention of pilots? A: It is safe to say that the downturn in the commercial industry has provided additional aviators that would otherwise not have been available in the same quantity or time frame. Of importance, however, is that the commercial industry is cyclical and that this source was influenced by not only economic issues, but the effects of September 11 as well. This particular cycle, while providing a larger resource at an opportune moment, may also have a deeper downside, as the economy recovers and the eventual demobilization of the Air Reserve Component takes place. Aviator Continuation Pay (ACP), or pilot bonus long-term take rate, is what we use as our best long-term indicator of retention, and it has jumped from 47 percent to 63 percent as of September 30, 2003. This is a valid indicator of the increasing health of the rated force. However, due to small initial eligibility groups caused by underproduction in the mid-1990s, significant long-term retention challenges remain. Additionally, based on numerous industry and FAA forecasts on the airline industry (layoffs have grown to over 8,000), we also expect Air Force pilot retention to remain above recent averages for at least the next three to five years and potentially even longer. We will continue to use Air Force recall programs and ACP to stabilize the Air Forceâ€™s rated inventory. This will effectively enable us to buy low while we can, in order to hedge against future airline hiring surges as we wait for the positive inventory effects of the 10-year pilot Active Duty Service Commitment and increased production to take full effect in FY08-10. Q: Your operations are truly on a global scale, with assets constantly on the move. Do you feel you have the information technology tools that are best suited for mission planning and tracking? What new systems are you looking to bring onboard? A: You are rightâ€¦ AMC assets are hard at work supporting global airlift and air refueling requirements 24/7/365. Managing those assets effectively and efficiently is a tremendous challenge for our forces, and AMC simply could not accomplish what we do every day without the help of information technology tools. For example, we have made great progress in providing our global customers with improved In-Transit Visibility (ITV) of cargo and passengers by using lessons learned from our industry partners. We can now more effectively track our resources from factory to foxhole, but weâ€™ve still got a lot more work to do in ITV. By communicating with our defense depots and using improved mode selection tools, weâ€™ve given DoD customers a better return on investment. Innovations in transportation systems and an integrated approach to data integrity have resulted in more accurate and timely customer service. We are working to provide command and control (C2) and ITV information across the Air Force enterprise and at all echelons with the migration and integration of multiple capabilities into a new version of the Global Decision Support System, which will be operational next fall. We have gone from the 22 C2 systems in the early 1990s, to todayâ€™s six C2 systems with even more integration. Additionally, we are working towards migrating AMC flight planning capabilities into the Joint Mission Planning System, which will provide optimized planning functionality to force level and unit level planners. We are also starting to realize near-real time, global connectivity between our command and control, deployed nodes, aircraft and civilian carrier operations control centers and their aircraft. Our Tanker Airlift Control Center flight managers are now receivinACARS (Civil Messaging), L-Band SATCOM (Data Communication), GATM (Commercial ATM messaging), Link-16 (Tactical Data Link), Combat Track II (81 sets for Beyond Line of Sight Secure Messaging), and Iridium Phones (Voice/Data SATCOM). These efforts are all partial solutions to providing information to the aircrew as they are flying. However, we currently lack global secure communication to all of our deployed nodes and our aircraft. The connection we do have is narrow in bandwidth, limiting the fidelity and quantity of information available to our aircrews as they are doing their worldwide missions. With the creation of the Tanker Airlift Control Center (TACC) and a migration strategy for C2 systems, AMC began a steady evolution towards improved collaboration with our global war fighting customers and civil aviation partners taking advantage of the Global Information Grid and new technologies. Using advanced technology flight management tools that link AMCâ€™s C2 and Transportation systems to an integrated database, TACC flight managers are able to communicate with aircrew and ATC agencies to dynamically re-task/re-schedule active missions to support changes in the operating environment. Improved weather forecasting, data link communications and increased mission velocity are changing the way AMC conducts business. Center (AFC2ISRC) and ESC to leverage existing technology in a way that will facilitate machine-to-machine linkages between mobility and combat operations centers, as well as direct linkages between deployed AMC assets and the war fighters they support. This synchronization will improve our response to changes and more dynamically re-task airlift and air refueling missions to meet the warfightersâ€™ changing scenarios.